The De Atramentis Standard Fountain Pen Inks come in a 35 ml glass bottle. 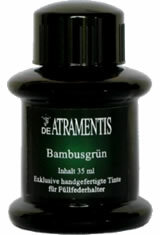 Made by Dr. Franz-Josef Jansen in Germany, the De Atramentis inks are suitable for fountain pens. The De Atramentis Standard (35ml) Fountain Pen Ink usually ships within 1 business day unless otherwise specified. Each De Atramentis Standard (35ml) Fountain Pen Ink we sell is guaranteed to be genuine, authentic and will arrive brand new & unused! This Poppy red ink in my opinion is a very pleasing red, it POPS out on the paper, if you desire a red ink that is bright and cherry red, I suggest this one. Great service from Pen Chalet, fast, and reliable. Great reliable ink with great colors. The colors we carry are not part of the Permanent Document ink collection so they are not permanent.